The AlterG® Anti-Gravity Treadmill® , the world’s first and only treadmill using NASA based anti-gravity technology, has been installed to help patients in their short-term rehabilitation programs. Orthopaedic Associates of St. Augustine will utilize the AlterG® Anti-Gravity Treadmill® to assist patients in their recovery after surgery, in addition to working with athletes on improved training and conditioning. 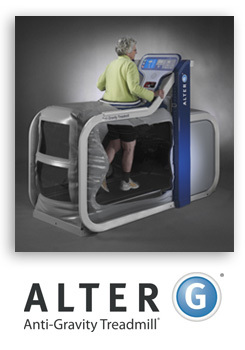 AlterG® Anti-Gravity Treadmills® enable faster rehabilitation, safer conditioning for the geriatric population, and weight loss, which can help remove major obstacles associated with these activities. Impact on the body and the pain of recovery are reduced, which helps people achieve better results. Patients at Orthopaedic Associates of St. Augustine can now rehab better, train smarter, and exercise safer with the AlterG® . With the AlterG® , patients can run and walk without bearing their entire weight, reducing the impact on the body to optimize rehabilitation and physical therapy outcomes. Its Differential Air Pressure (DAP) technology applies a lifting force to the body that reduces weight on the lower extremities and allows precise unweighting – up to 80% of a person’s body weight, so people can find exactly where the pain stops and natural movement feels good again. There are a multitude of benefits when training and rehabilitating on the AlterG® . Patients can use the AlterG® Anti-Gravity Treadmill® to recover from injury and surgery and it allows them to immediately do partial weight bearing exercises. Patients with neurological disorders maintain, and in some cases even regain functionality and mobility working with the AlterG® . It is also used as a motivational tool for obese patients, as users can immediately experience what it would feel like to weigh less, exercise with less joint impact and stress, and improve their cardiovascular health. AlterG® Anti-Gravity Treadmills® are designed to be used for lower body injury and surgery rehabilitation, aerobic conditioning, weight control and reduction, sport specific conditioning programs, neurologic retraining, and geriatric strength and conditioning.